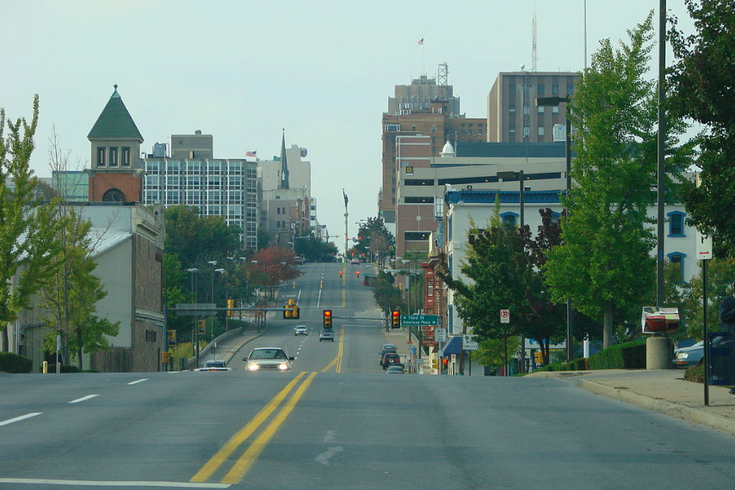 Hamilton Street in downtown Allentown, Pennsylvania. A new national study of evictions and housing affordability finds that Allentown currently has the highest rent income ratio in the United States, putting pressure on local renters to make ends meet. The study, conducted by real estate brokerage and analytics firm Redfin, combed through data on court-filed evictions in 19 states and compared this information with gross-rent-to-household income data provided by the American Community Survey of the U.S. Census. Informal evictions, which may be more prevalent, were not included in the study. By a wide margin, Allentown had the highest percentage change in median rent-to-monthly income from 2011 to 2014, with an increase of more than six percent. Philadelphia came in at number 11 among the 30 U.S. metro areas listed among the worst in the study. According to WFMZ-TV in Allentown, the city's average apartment rental goes for about $1,100 a month, marking an increase of more like 22 percent over recent years. More than 20 million renters in the United States — over half — spend more than the recommended 30 percent of their income on rent as of 2015, Redfin found. Housing costs have risen 19.4 percent from January 2011 through October 2016, outpacing a modest increase in median income gained by some sectors of the workforce. This pressure has produced a dramatic increase in evictions in some cities, including Newark and Camden, where the number of cost-burdened renters has risen with the price of housing. An estimated 2.7 million people faced eviction in the in the United States. "Without an expansion in policies to address the affordable housing shortage and the increase in cost-burdened renters, evictions will become an even more prevalent feature of the U.S. housing market," Redfin concluded. The study comes after new United Way ALICE report found 37 percent of New Jersey households could not afford basic needs from housing and childcare to healthcare, transportation and food in 2014. That number was up from 27 percent in 2007, prior to the financial crisis and subsequent recession. Even Federal Reserve Chair Janet Yellen recently noted that the income gap in the United States is a serious long-term risk to economic stability and growth. Compared to a 66 percent increase in U.S. rents since 2000, household incomes have risen just 35 percent.